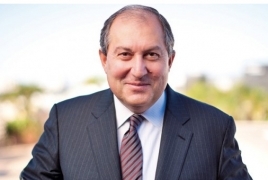 PanARMENIAN.Net - Armenian President Armen Sarkissian has congratulated his Iranian counterpart Hassan Rouhani over the 40th anniversary of the Islamic Revolution. In his message, Sarkissian stressed the importance of maintaining and developing stable and mutually beneficial relations between Yerevan and Tehran. He expressed confidence that both sides will make effort and invest resources to that end. The Iranian Revolution of 1979 was a series of events involving the overthrow of the monarch of Iran, Mohammad Reza Shah Pahlavi, and replacing his government with an Islamic republic under the Grand Ayatollah Ruhollah Khomeini, a leader of one of the factions in the revolt.